Based on a meeting in November 2000, this book brings together researchers from a wide range of disciplines to examine the biological, behavioral, social, cultural and ethical aspects related to the placebo effect. Perspectives on the necessity for including a placebo in randomized clinical trials will also be examined. This is the first attempt to examine the evidence-base of the placebo effect and will provide important information for clinicans. 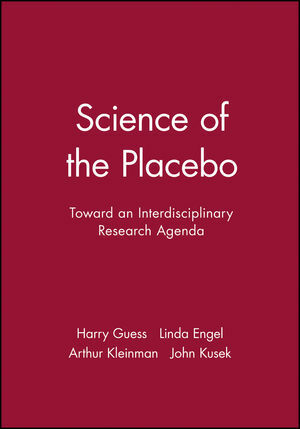 Harry Guess is the editor of Science of the Placebo: Toward an Interdisciplinary Research Agenda, published by Wiley. Linda Engel is the editor of Science of the Placebo: Toward an Interdisciplinary Research Agenda, published by Wiley. Arthur Kleinman is the editor of Science of the Placebo: Toward an Interdisciplinary Research Agenda, published by Wiley. John Kusek is the editor of Science of the Placebo: Toward an Interdisciplinary Research Agenda, published by Wiley. Section 1: Historical and Ethical Perspectives. 2 “Seeing” the Placebo Effect: Historical Legacies and Present Opportunities. 3 Ethical Issues in Use of Placebo in Medical Practice and Clinical Trials. Section 2: Elucidating Placebo Effects: Explanatory Mechanisms. 4 Explanatory Mechanisms for Placebo Effects: Cultural Influences and the Meaning Response. 5 Explanatory Mechanisms for Placebo Effects: Cognition, Personality and Social Learning. 6 Explanatory Mechanisms for Placebo Effects: Pavlovian Conditioning. 7 Regression to the Mean or Placebo Effect?. Section 3: Elucidating Placebo Effects: Intervening Psychophysiology. 8 Neuriendocrine Meidators of Placebo Effects on Immunity. 9 Endogenous Opioid and Non-Opioid Pathways as Mediators of Placebno Analgesia. Section 4: Use of Placebo Groups in Clinical Trials-Methodological and Ethical Issues. 10 Placebo controlled Trials and Active Controlled Trials: Ethics and Inference. 11 When is it Appropriate to Use a Placebo Arm in a Trial?. 12 The Pros and Cons of Non-Inferiority (Equivalence) Trials. 13 Use of Placebo in Large-Scale, Pragmatic Trials. 14 Placebo Controls in Clinical Trials of New Therapies for Conditions for which there are Known Effective Treatments. Section 5: Priorities for Future Research. 15 The Research and Ethical Agenda. Section 6: Conclusions and Future Directions. 16 Conclusions and Future Directions.